I was completely blown away by this: I laughed, I cried ... it was so good. This was a really good one man show, and also interesting for a number of things, including the Hindi/Urdu (?) where sometimes he tells the story in that first, then English. The use of projected background images is also really effective (especially the social media stuff with his erstwhile prom date), and I suspect we'll see more of that in the future. I loved this and also thought Sam Spratt's paintings were a charming touch. More illustration with comedy, please! I like that Netflix is getting behind these shows that are more one man shows than a standard stand up special. Neil Brennan's 3 Mics and Colin Quinn's New York Story were also Netflix Originals. I like pure stand up but not everything fits that mold. I don't think we would have gotten something like this from Comedy Central and he's not a big enough name for HBO. I was also blown away and thought the production design was amazing. It was definitely funny, but it was so much more than that. He's one of my favorite TDS correspondents, but I really didn't know how riveting he could be before I saw this. The bit with the spelling bee champ and his family was great. He just won $40,000 cash! The prom story was so devastating. I probably should have seen it coming but I didn't! He's setting you up the whole time to see the insularity of his own family/community and then it comes as a gut punch. But then the conversation with his dad at the end ... oh man, that was powerful. I was really surprised, charmed and affected by this. I went into watching it expecting a basic (but funny) standup special. What I got instead was something that morphed into an extended story without me realizing it at first. I liked the setup in the beginning -- all the stuff about his family and his history -- because it was important background for the story he was actually telling. It was beautiful and funny. I really enjoyed watching this, and like darksong and others was really moved when it became clear what it was all about. Right after watching this on Netflix, I watched another great stand-up movie called Just Like Us. I highly recommend, it's got the same vibe. Very moving, and uplifting. This was great. Like others, the production values and pacing just made it really effective and easy to watch. I love the balance between the humour and seriousness. It hits so many of the same notes that I've lived through, so I connected with it on that level - but his life and story are also so different to mine. Really enjoyed this and the central focus being on race and how that really underpins so much of an immigrant's life. The technical advances are great; from the narrative structure of the set to the really effective use of the big screen, spotlight, and small unobtrusive bits of set. 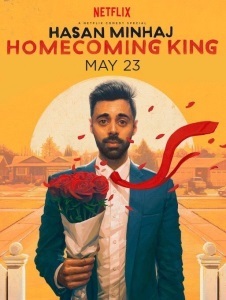 Minhaj is a good looking dude, it's interesting that he made use of his highschool yearbook photo (I wonder if he photoshopped the acne back in? Mine was certainly highly airbrushed out.). Homeboy Trouble makes an excellent point about Minhaj telling stories first in his parents' native tongue before translating it in English - it really creates a sense of intimacy where he brings the audience into his world and then welcomes the audience into it with the translation. Really not sure what to feel about the prom story and how it grew over time. Touches nerves in a lot of different ways; ways that evolved as the story did.